Recognizing the impact of his tenure on students, faculty, and peers, the Board of Visitors of the University of Pittsburgh’s Swanson School of Engineering recognized McGowan Institute for Regenerative Medicine affiliated faculty member Robert Parker, PhD, with the 2017 Board of Visitors Award. 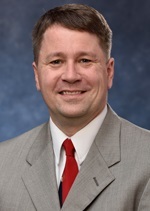 Dr. Parker, Professor and Vice Chair for Graduate Education in the Department of Chemical and Petroleum Engineering, was recognized for faculty excellence in teaching, research, and service, and for contributions to the University, the Swanson School, and the engineering discipline. Dr. Parker joined the University of Pittsburgh faculty as an Assistant Professor in 2000 and promoted to Professor in 2014. His research program focuses on systems medicine and the use of mathematical models in the design of clinical decision support systems. In addition to the Outstanding Educator Award, he has been recognized for excellence in education through the Carnegie Science Center Excellence in Higher Education Award and the David L. Himmelblau Award from the Computing and Systems Technology (CAST) Division of AIChE. His commitment to a collaborative future in graduate education formed the basis of two funded Department of Education Graduate Assistance in Areas of National Need (GAANN) training programs, as well as the Systems Medicine Research Experiences for Undergraduates (REU) program. As Vice Chair for Graduate Education, Dr. Parker is responsible for developing graduate-level training programs to support PhD students, leading graduate recruitment and admission; managing PhD timelines; collaborating with the Swanson School Office of Diversity to maintain a diverse graduate program; serving as faculty advisor of the Department’s Graduate Student Association; and, managing faculty teaching assignments.